The latest NetEnt slot machine, which seems to be constructed as a sequel to Starburst, as the title suggests, amazes the audience with its impressive design and payoffs. If you are not decided if playing this slot is a good idea, you can try it for free in most online casinos which have NetEnt on their gambling software providers’ list. For more details about this fantastic fruit machine, read the article below and start playing the online game. Berryburst Slot Machine is a five reels, three icons online fruit machine. Nowadays, fruit-themed slot machines begin to be more and more appreciated. Some decades ago, they were the only available type of slots and they easily gained their popularity through both children and adults as the prizes were different-flavoured fruit chewing gum. You can spin the reels for any amount between 0.1 EUR to 100 EUR and the maximum payout you can get is x5000. The 3D slot machine can be played on auto mode, so you can watch the reels spin, while you relax, enjoying a cup of coffee. Hit the combination which gives you Free Spin and gamble for free even more hours. Berryburst Slot Machine has two wild symbols, which randomly appear on the screen and provide the gambler with special features: the Regular Wild and the Expanding Wild can substitute any other symbol and they can also activate re-spins. Berryburst Slot Machine is the younger brother of the much-loved Starburst Slot Machine, both being developed by one of the top players in the gambling software developing industry, NetEnt. Do not hesitate in playing it, as you will be pleasantly surprised. 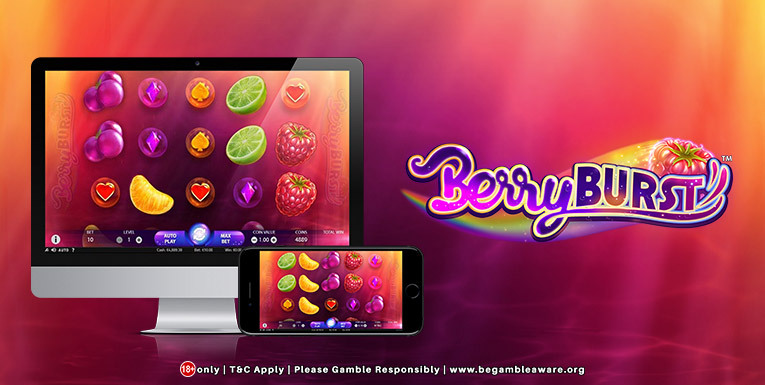 Even though it is a fruit-themed slot machine, which is rather a common theme for classic slots, Berryburst catches your eyes with its tremendous graphics and design.